I’ve mentioned the ABC show Jamie Oliver’s Food Revolution in the past, including the episode where Jamie Oliver brings a real cow on the set to show people what part of the cow their meat comes from. I caught up with the latest episode of Food Revolution tonight, where I saw my featured cow of the day. In this episode Jamie Oliver finally manages to get into the Los Angeles school he’s been kept out of by a bunch of school board paranoid bureaucrats. There he’s allowed to teach kids about food, but first has a chance to quiz them about the origing of various foods. 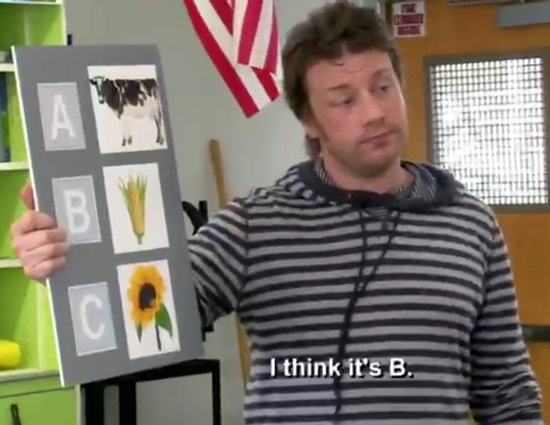 Fast forward 22 minutes into this Jamie Oliver’s Food Revolution episode and you’ll see Oliver ask high school students (yes, I said high school, not kindergarten): Where does butter come from? Jamie Oliver's Food Revolution - where does butter come from? While most students seemed to know that butter actually comes from a cow, a disturbing number of them answered B, from corn. Yep, you heard right. Butter apparently comes from corn. I’m guessing the kids who answered corn only have margarine at their house, and corn is usually featured on the lid. Could someone please tell these kids that margarine is not butter? I’d recommend this Jamie Oliver episode to anyone looking for a breakthrough in Oliver’s efforts to bring healthier food to Los Angeles. This episode has a happy ending that the previous two episodes didn’t have – it’s worth your time. ABC series ABC show animals cow and butter cow butter Cow of the day cow sighting cows cows on Facebook Daily cow dairy cows Facebook cow food revolution food revolution show jamie oliver jamie oliver food revolution postaday2011 see a cow every day tv show videos where does butter come from? Next Post Did you know there are cows in the rainforest?